Newcomer Family Obituaries - Brandon James Bright - Newcomer Cremations, Funerals & Receptions. 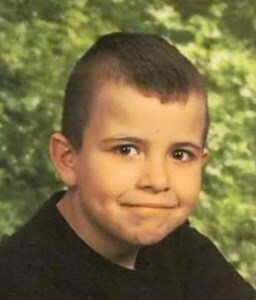 Brandon James Bright, age 11, of Toledo, passed away February 6, 2019 after a hard fought battle with brain cancer in his home surrounded by family . Brandon was born January 28, 2008 in Toledo to Kimberly Joseph Larde. He was a 5th grader at Robinson Elementary School. Brandon enjoyed many things in life, especially Batman, NASCAR, wrestling, Fast and Furious, Pittsburgh Steelers, Kane Brown, Blake Shelton, monster trucks. He is survived by his mother, Kimberly (Michael) Joseph-Larde, siblings, Krystal Bright, Olivia Bright, Jeremiah Reigle, Tyler Blakemore, Addie Nash, Zachy Blakemore, Devon Blakemore, Sandy Rapp, Kelly Perry, biological parents Sarah (Daniel) Nash and Jeffery (Rebecca) Blakemore, grandmother, Diana Born, aunts and uncles, Matthew Blakemore, Daniel Born, Benji Perkins, Joseph Perkins, Jared Perkins, John Jack Perkins, Leroy Rapp, Vicky (Scott) Stults, Kimberly Perkins, Cyndi (Brian) Mansberger, five nephews and one niece and many cousins and numerous friends. The family will receive guests Monday, February 11, 2019 from 2:00 pm - 8:00 pm at Newcomer - Northwest Chapel, 4150 W. Laskey Rd. (419-473-0300). Funeral Services will begin Tuesday at 11:00 am. at the funeral home. The family would like to especially thank hospice nurse Tabitha and all the teachers at Robinson and Birmingham Elementary Schools and the Tackle Team for all their love and support during this difficult time. The family suggests memorial contributions be made to the American Cancer Society in Brandon's memory. To leave a special message for Brandon's family, please click on the "Share Memories" tab above. Add your memories to the guest book of Brandon Bright. Dear family of Brandon...we do not know one another, however, l wanted to send my sympathies. My oldest grandson is 1 day older than Brandon and I cannot imagine something happening to him. My brother died at age 11 and my mother suffered for years. May you have the assurance if God wrapping his arms around him and giving both he and you peace. I am so sorry for your loss. Rip little one. You are at ease now and not in any pain. We don’t know you but just wanted to let your family know we are praying for you guys. Much love and respect from the McNamee’s lord Jesus please comfort this family lord we are asking you please help them fight this pain. RIP Brandon,While You were in my class at Birmingham, I could never forget the times that you made me smile. I will never forget your smile . I meet Kim and her family on valand st. They lived next door to me. At this time Brandon was 1yr old .I and Brandon new We were be around each other for along time.I watch him grow up.He come over to visit me,then when he seen me he got excited to see so I would go over there to give him a hug or just talk to him.Someday he would come over to spend the night with us.We'd play video games go out to eat .Now all this has ended so sad that he is now gone.I will miss him so much ,but now he's in haven enjoying no pain and everything he enjoys to do.luv u Bandon RIP my little buddy. Luv Bob and Mike. Brandon you was such a very special man,i will miss the time when dad brought you over to the house and you sat on my livingroom floor and we played cars.....you always made me laugh......we love and miss you...love you always Aunt Betsy And Uncle Mel. I didn’t meet you but met a good sister of you through social media. I really tryed hard yo get Kane Brown to see you through everyone. Please watch all of us Brandon. Love Emily and Angelo Favreau. I only meant u a few times but it felt i knew u forever. Im your great aunt and i love u and im gonna miss u like many will . u was gone to soon but god gained a special angel. Rip buddy fly high and watch over your family keep them safe hugs to u in heaven until we meet again. Im so sorry for the familys loss prayers going up. I will always love u and miss u now more than ever. I only met you a couple times but we are cousins. I know you are in a better place. I give my blessings.